Broad Shaped Wooden Showroom Hangers in Black gloss finish. Includes a pearlised nickel hook. This hanger is 46cm (460mm) wide. Sold as a box of 12 hangers. 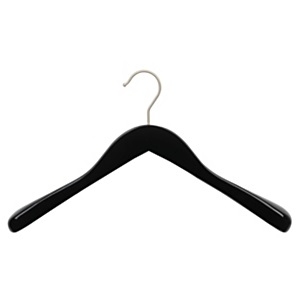 Perfect for the retail environment and sold to retailers throughout the UK and equally suited to the home the broad wooden showroom hangers are ideal if you require a hanger for garments such as coats & jackets to take substantial weight with its broad ends.